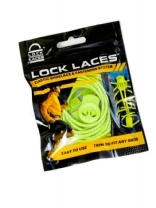 Never Tie Your Shoes Again™ Lock Laces®, the original, patented elastic no tie shoelaces. Our patented double-eyelet lock device makes it easy to make adjustments and holds your laces in place better than any other system on the market. RRP:£6.99. One Size.